Continuing on from my previous blog post about National Scholarships, the Rhodes, Marshall, and Cambridge-Gates all fund studies in the United Kingdom. The Fulbright on the other hand is a different story. The Fulbright funds 2-12 month research projects in numerous locations around the globe. The research proposal is completely up to the student – you are free to propose any study you wish to undertake. If the Fulbright Committee feels it is worthy of funding, they provide upwards of $30,000 to send you into the field. As you know, I have been reading Dian Fossey’s book Gorillas in the Midst, where she set out on a multi-year research project to study the mountain gorillas of the Belgian Congo. She was funded by the National Geographic, one of my favorite organizations, and also a partner of the Fulbright Institution. During the time of Dian Fossey’s study, Jane Goodall was in Gombe, Tanzania studying the Chimpanzee. Like these two ladies, I would LOVE to be sponsored by National Geographic. I tell Andrew almost everyday that my dream retirement is to be a photojournalist for National Geographic. Today marked the first day of my exercise, scripture study filled morning and I’m happy to report I did both activities. I spent a good 20 minutes reading from the liahona (conference edition) and studying about the sacredness if family and familial relations. Following my spiritual exercise I started my physical exercise! It was a good thing I started this goal because only a few minutes into the climbing exercise (the one I used to train the climbing team) I was huffing and panting. Lost a lot of strength here in Africa! After we finished getting ready Kylie and I were off to the office for another productive day of work. Data still was missing from Malingunde and Kasungu, but we were able to tackle several other items which mainly surrounded the task of getting organized. While Kylie has been working on her school papers and scholarship applications I’ve been working on other things, namely preparing for the journey ahead. In a couple weeks we depart Malawi and there’s going to be several transitions ahead of us (on the road). So Kylie has me tasked with finding people to host us, finding buses and bus routes, and determining costs. We’ve found I tend to work better with specific, outlined goals of what I am to learn, Kylie enjoys the general process of researching these things. Time flew by at the office and we were soon walking back to George and Flossy’s home to cook a delicious dinner of cabbage, beans, tomatoes, onion, garlic, sweet potato, and spices. Think Indian curry with African cooked beans- yum! We don’t always eat mice.. 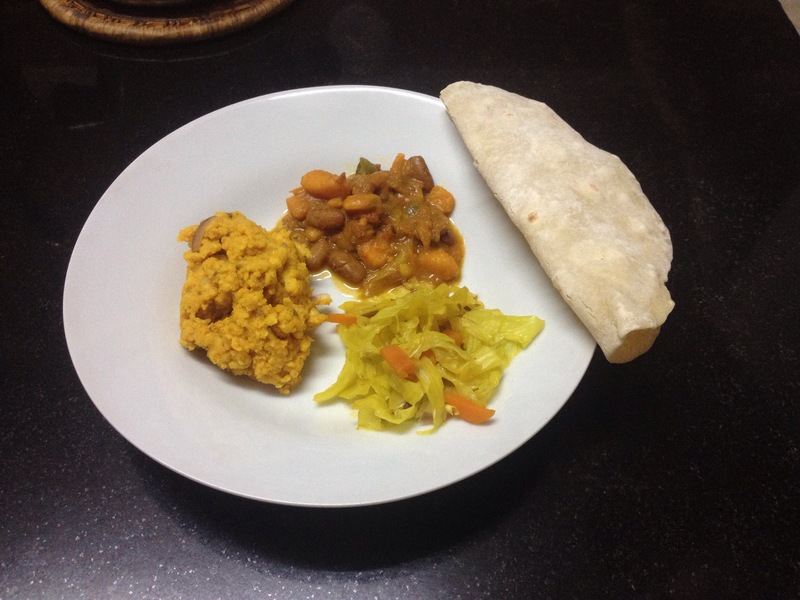 Sometimes we just eat homemade Ethiopian, our favorite!